My blog on the tradition of the wedding dress colour was very popular, so now I am going to look into the traditions behind the wedding ring. The purpose of engagement rings and wedding bands is to convey deep emotions of eternal love, eternal happiness, eternal commitment, and eternal togetherness. These rings signify eternity – between the giver and the recipient. A ring, of course, is a complete circle with no break and no end or beginning, which means that it just goes on and on – it is eternal. This is often mentioned during the marriage vows. Photo: My lovely engagement ring that was my Gran’s Ruby Wedding ring. These days, many people take wedding bands and engagement rings for granted, and although they give these beautiful items of jewellery with integrity and love, they are often given with no real knowledge of the meaning behind them . They haven’t always been the shiny jewel encrusted bands that we see in the shops today. Now we have a lot more choice as to where and how we get them. Paperless Wedding supports the eco wedding rings which are becoming more common. They got a good bit of promotion when Natalie Portman got engaged. Her ring was created by jewellery designer Jamie Wolf, Portman’s custom-designed ring is made of recycled platinum and its diamonds are certified as conflict-free. The first wedding band is thought to have originated in Ancient Egypt, where it is said that plant sections were fashioned in to circles to signify never-ending and immortal love. It was thought that the fourth finger (which we now know as the ring finger) contained a special vein that was connected directly to the heart, and therefore this became the official finger for the wedding band. The Romans saw the ring as a symbol of ownership where Roman men would “claim” their woman with the giving of a ring. Some women today find this symbol distasteful as in the era of equality they do not wish to be ‘owned’. Puzzle rings were a complex type of jewellery that were once popular in Asia, and these jewels had the charming knack of being able to fall apart and put back together again – if you knew how to do this! (They were a contemporary fashion item in the 1970s…my mum had one!). Wealthy Middle Eastern men then began to use these rings as wedding bands for their wives, who were often forced to wear a puzzle ring when their husband was away. When the husband returned and found that the ring had fallen apart then he knew that she had been unfaithful! During Colonial times when puritanical views were held, all items of jewellery in America were prohibited due to their apparent moral worthlessness. Instead, a more practical thimble was given as a token of love and as a pledge of eternal togetherness. However, after they were married, the women tended to remove the bottom of their “engagement thimble” to form a type of ring. Men started to wear wedding rings around the time of World War 2 when they wore them to remind themselves of the wives they had left at home. The ancient Greeks are thought to have given a form of engagement ring, a betrothal ring, but these were more like friendship rings and did not necessarily mean an intended marriage. Sparkling engagement rings as we know them today became popular in around the fourteenth or fifteenth century, when the rich and the royal could afford and wear these jewels although the bands may not necessarily be made of gold. It was many centuries before these engagement rings would become more popular or traditional. 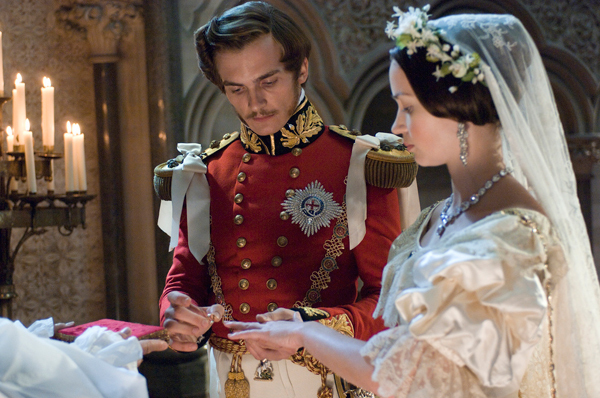 When Prince Albert gave Queen Victoria a diamond ring as a memento the current fashion for diamond engagement rings could have been initiated! Rings can also be handed down through a family as Prince William has given his future wife Catherine his mothers sapphire and diamond engagement ring. As I said earlier my engagement ring was originally my grandmothers!! Whatever the ring, plaited hair, metal or gold, bejewelled or plain, are given and received with love! Where did yours come from?…….do let us know.